The first time I heard of Dustin Gilding was back in 2009 from the DH Productions’ ‘Here We Go Again’ movie. I really liked those dumped 3’s and his style of riding. 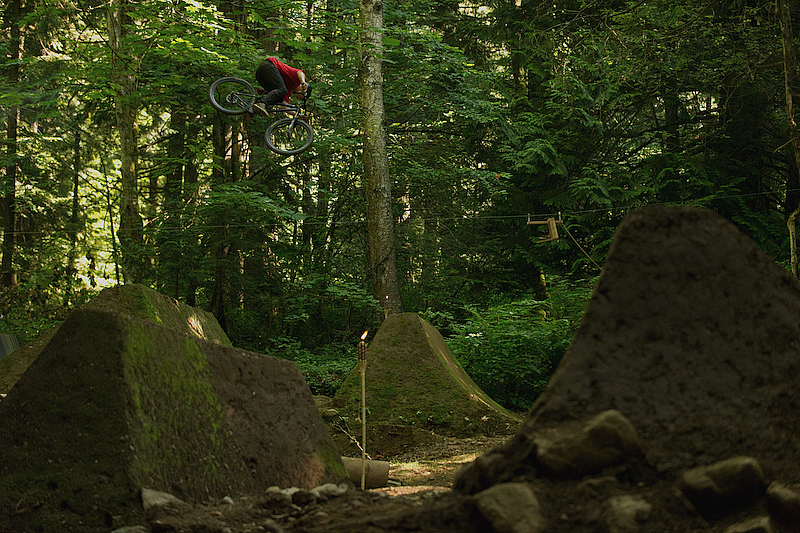 In the last couple of years he has put together some pretty good web-edits showcasing his riding and digging skills. He recently showed everyone through Absolute Zero’s ‘From The Ground Up’ video one of the best looking backyards out there. 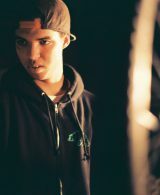 Also, he is one of the main guys behind the Red Bull Joyride course. Continue reading if you want to know more of him. My name is Dustin Colby Gilding and I’m just another dude trying to make it in the mountain-bike industry. I’m working at Woodworks Solid Wood Furniture in Abbotsford right now, but I’m heading up to Whistler soon to start working on the 2014 Red Bull Joyride course. I rode a lot of motocross as a kid and into my early teens, then one day a friend of mine took me up the local hill to ride some mountain bike trails. I wound up falling no less than 20 times but was totally hooked, and when we moved up to a piece of land on the mountain I started focusing more heavily on bikes. There’re so many I don’t even know where to begin, but when all the riders were stoked on the Joyride course last year was one of the proudest moments of my life, for sure. Bikes are really what my life revolves around when it comes down to it. The vast majority of my time is spent riding, digging, or thinking up things to build, and I’ve met a ton of incredible people through bikes, so riding means a lot to me, there’s no question about that. 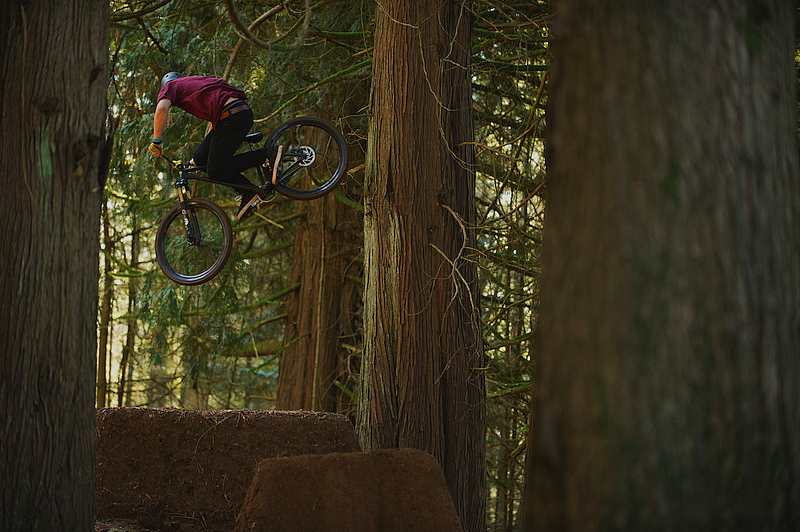 It really depends on where I am at the time, but this winter I’ve done a lot of riding with Mike Ostbye, Nick Tingren, Anthony Messere, Reece Wallace, Wink Grant and Paul Genovese. 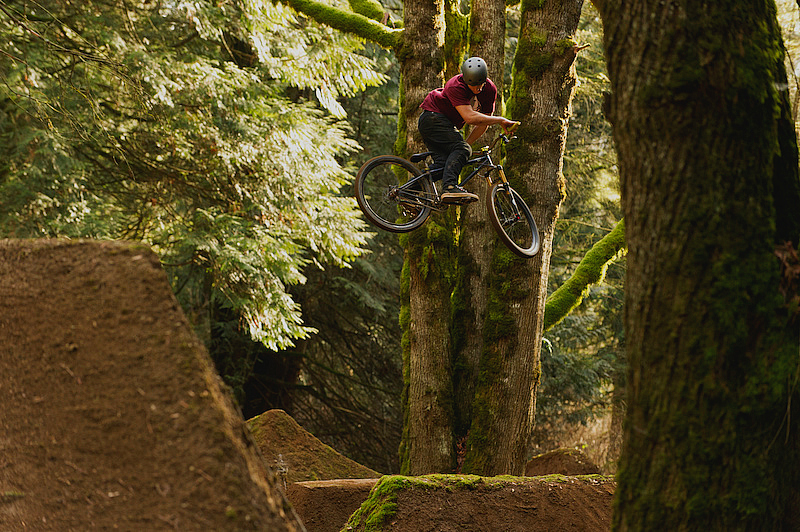 There’s also the guys from Washington like Dylan Bibbins, Damien Douglas, Cole Cook, Steven Bafus, Scott Scamehorn and Drew Vandegriend who are always shredding when we hit up Burlington Bike Park. There’s a pretty strong group of guys in the area right now who kill it on the bike and are great people and thats always nice. I am a big fan of creativity, originality and style, so any guys who are pushing those factors are definitely an inspiration for me. 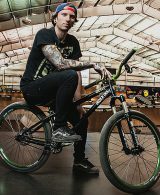 I follow mostly BMX, I could watch guys like Matt Priest, Matt Roe, Robbo, Ryan Lloyd, Chase Hawk, Dan Foley or Kriss Kyle forever, they just have so much fluidity to their riding and thats something I try to emulate. 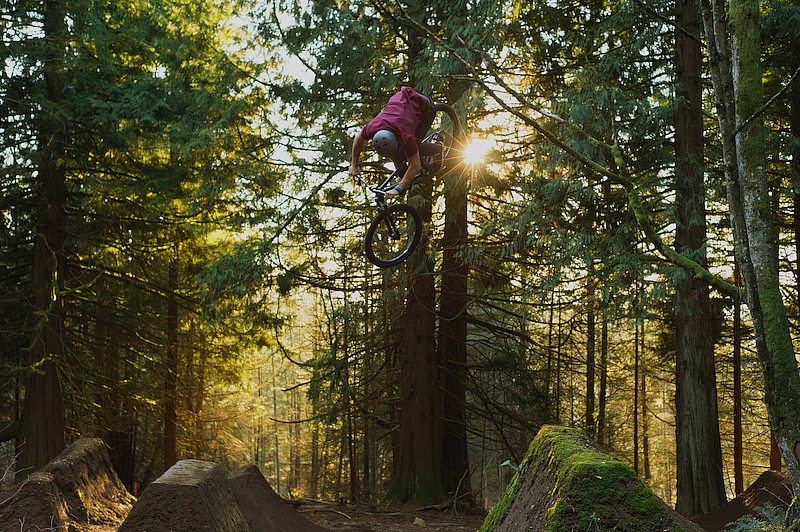 It’s also no secret that the best jumps in the world are built by BMXers, so from a building standpoint thats another source of inspiration for me. I. Hope. This. Looks. Good. I’ve broken a collarbone, a toe, and most recently my leg. Also, my ankles have taken a ton of abuse over the years with no signs of slowing down, but I’m wearing more braces and pads these days to try to prevent those types of injuries. They definitely aren’t a fan of hearing about the constant aches and pains I have haha, especially my mom, but they know I love this sport more than anything and sometimes it’s just part of the game. I’m extremely lucky to have the support that my family gives me, even if deep down they’d probably prefer I play chess or something. Probably complacency, I just never want to be at a point in my life where I’m unhappy with what I’m doing and not doing anything to change it. All of those would each be incredible, but given the opportunity I’d rather film a video part that I’m proud of. I think theres a lot of opinions and a lot of products and I think everyone should just do what makes them happy. There’s mass argument on the web about anything you could possibly imagine to do with mountain biking, from wheel size to contest winners and it’s easy to get sucked in and frustrated, but I just like to ride and dig, bottom line. I’m going to be working for Joyride Bike Parks building the Crankworx course and some other projects, as well as filming as much as I can. Hopefully I can squeeze in a couple contests also. I really want to check out the UK trail scene at some point, and I’ve heard a lot of good things about New Zealand, so hopefully one day I’ll find out what those places are like. My hardtail is a DMR Sect with a Fox 831 fork, DMR parts all around and the trusty Shimano XT brake that I’ve been running for about 4 years now. I’ve already listed my favorite BMX riders so I’ll do MTB this time: R-dog, Jimmy Pratt, Brendog, Martin Soderstrom, Aggy. Follow Me, NWD 8, Alchemy, From the Inside Out and I assume Rad Company is going to be incredible so let’s just put it up there as well. Of course! Big thanks to my sponsors DMR Bikes, Fox, Smith Optics, Dissent Labs and Lavan for supporting what I do, without them my bikes would be janky and my opportunities would be slim. And a bigger thanks to my parents for letting me tear up the yard for the past 6 years, without them I wouldn’t have sponsors or opportunities. Shout out to Bicycle Nightmares and anyone who’s ever supported me in any way, you guys are the reason I get to do anything cool with bikes and I’m so thankful for it.